When given the task to participate in “Eat Like an Italian Month” in October, which also marked National Pasta Day October 17 I just chuckled. I eat like an Italian every day, since I am 75% Italian. Not officially the percentage but that I what I grew up believing anyway. 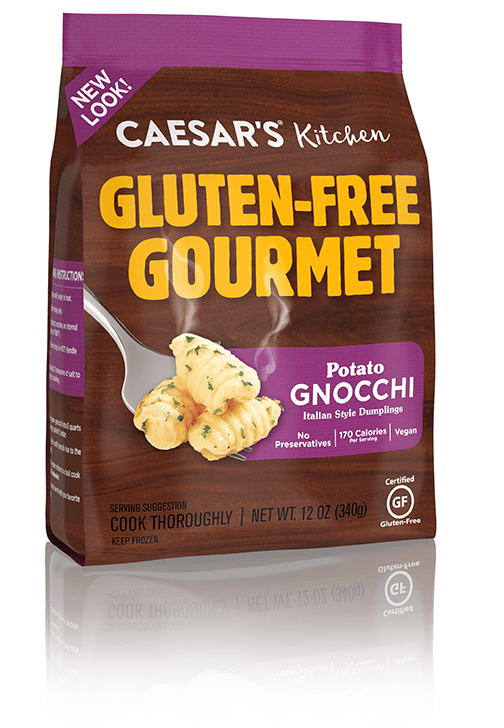 Caesar’s Kitchen is a fairly new line of USDA-Certified Organic and Certified Gluten-Free line of fresh-from-the-freezer gourmet pasta meals. I was given the choice of trying the frozen Gluten-Free Ravioli or a Vegan Potato Gnocchi that feeds at least four people, and we went with finding a fun and healthy recipe for the Gnocchi. Be sure to read all the way down to see the <GIVEAWAY> . Frozen pasta is even faster to cook than dried pasta. 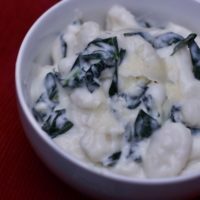 This Parmesan Kale Gnocchi Sauce Recipe is the ultimate weeknight gnocchi sauce that will be a true crowd pleaser. It does not take that long and actually the sauce and pasta mixture held up for a few hours in between kids coming home for dinner. 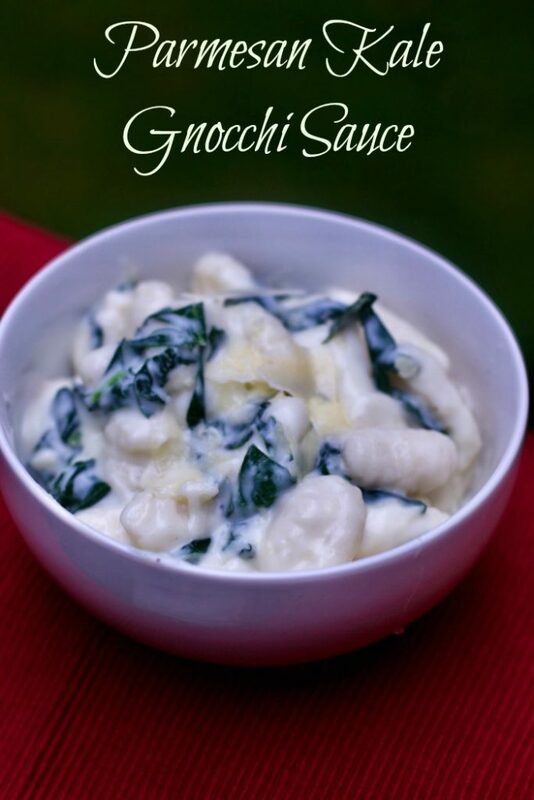 Can’t wait to hear what you think of this Gnocchi Sauce recipe. Gnocchi is a pretty quick cooking pasta. As soon as the individual pieces rise to the top of the water, they are ready to serve. 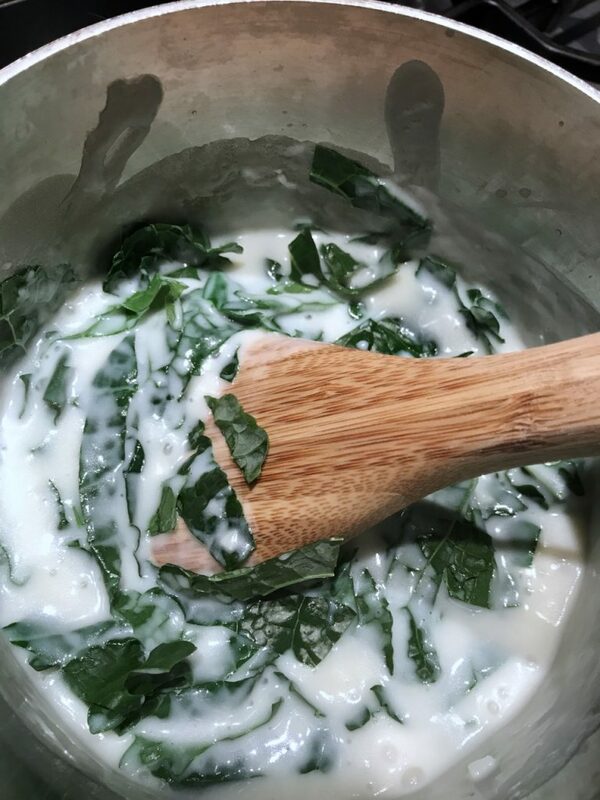 The sauce is a typical creamy cheese sauce that will go great on top of mainly different dishes. This is not a vegan recipe but it is vegetarian. 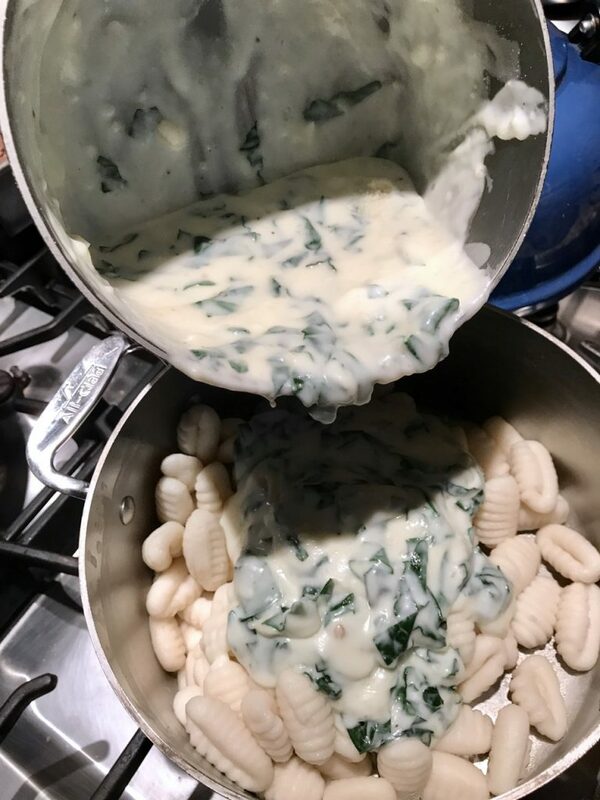 Once the gnocchi sauce is finished cooking just mix it all carefully in a bowl and serve with some extra grated or shaved parmesan cheese. 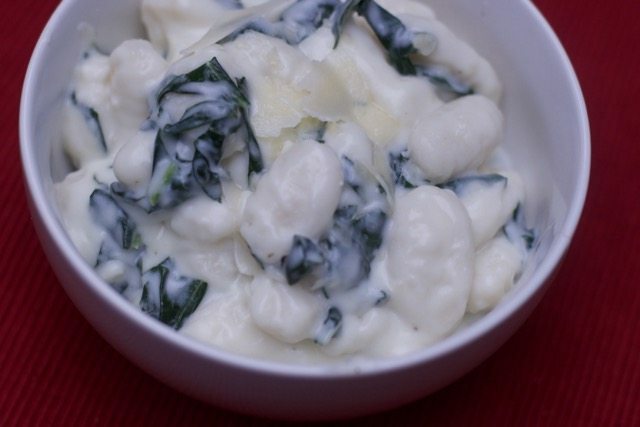 What do you think of this gnocchi sauce recipe? It makes a great side dish to a grilled meat or fish. Cook the gnocchi according to package directions. Drain, set aside, and return the empty pot to the stove. Add garlic to butter and sauté for about a minute until garlic is fragrant. Add flour to butter and whisk to form a roux. Cook for 30 seconds or so to cook out any raw flour taste. Slowly add milk to roux, whisking constantly to break up any lumps. Cook for 2-3 minutes until sauce has just begun to thicken. Stir chopped kale into sauce and cook 5-8 minutes more until kale has wilted and cooked. The sauce should be thickened too. Add parmesan cheese to sauce and stir to combine. 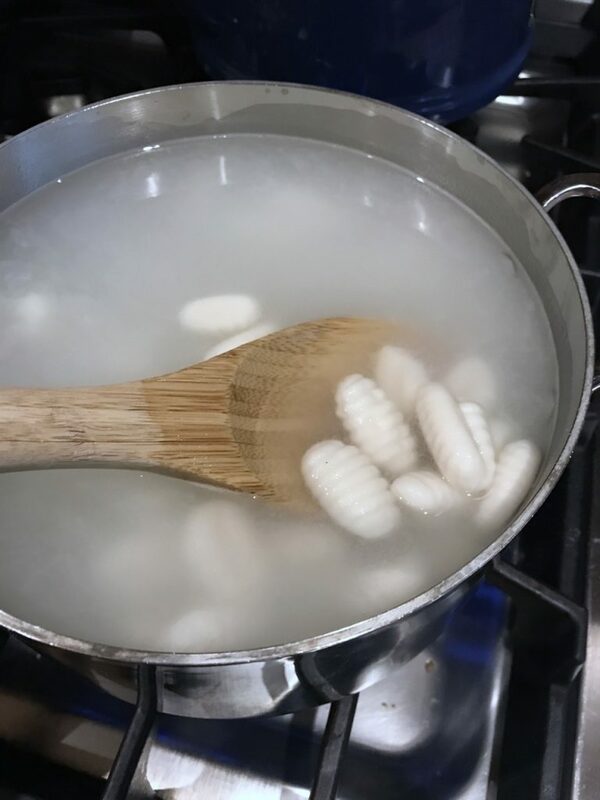 Return cooked gnocchi to sauce and stir to combine. Serve immediately for best flavor. Tomato Sauce, ground beef, green peppers, onions, celery and carrots. My favorite way to dress pasta, a simple garlic and butter sauce, topped with broccoli and parm. I like tomato sauce and parmesan cheese. I love to top my pasta with fresh spinach, alfredo sauce, and sauteed shrimp. My favorite way is with tomato sauce and lots of grated cheese! I usually got with a red tomato marinara sauce on my pasta. I like red sauce on my pasta. I like pasta with olive oil and butter. I like grated parmesan cheese on pasta. I love to sprinkle romano cheese and lots of pepper! I like to make my ‘copycat’ egg-mcmuffins with eggs. My favorite way to use eggs is in a cheese omelette. I love simple scrambled eggs with cheese. I like making homemade puddings and egg nog for the holidays! Omelettes are my favourite way to eat eggs! 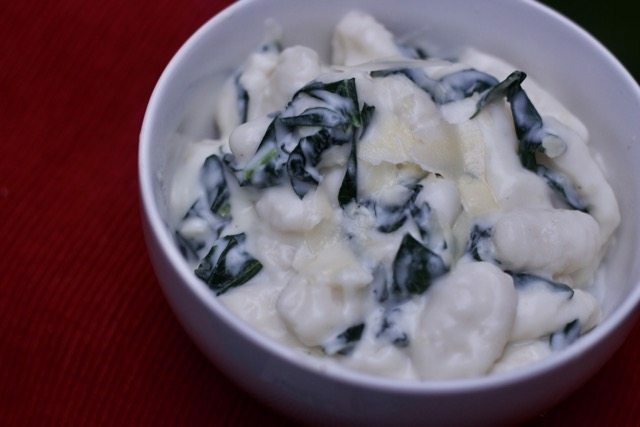 I love Italian food but I’ve never tried gnocchi, would love to though! Oh I love to use eggs in my chicken fried rice! So yummy!!! I am so excited to see this gluten free Gnocchi! I have not had that since my diagnosis about 13 years ago now. I have to find who sells this by me! The ravioli would be so good too! I love a good fried egg sandwich! I love to make a cheese and mushroom omelet! Poached eggs are my absolute favorite, with a little butter and black pepper. My favorite way to eat eggs is scrambled with onions and cheese. My favorite way to use eggs is in a quiche! i usually add mushrooms, cheese, milk, ham, and spinach! I love using eggs to make delicious veggie omelets. I love to make decadent loaded omelettes on the weekends. Thanks for the giveaway! My favorite way to use eggs is in egg salad or deviled eggs. Love to make scrambled eggs with cheese. I like using eggs in baking. That looks delicious. We love omelets on the weekend.